A few months ago I happened across a St. Bernardus gift set at Martin Wine Cellar on Perkins Rd. in Baton Rouge. Being a complete sucker for gift sets that include a glass, and seeing as how two of the four beers were new to me, I couldn't pass it up. 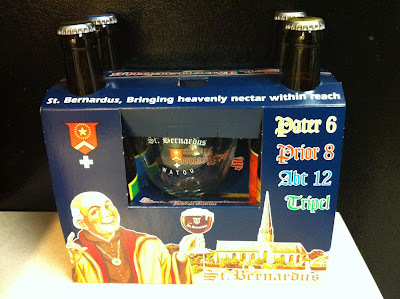 The gift pack included the St. Bernardus Pater 6, Prior 8, Tripel, and the fantastic Abt 12. In fact, my old post about the St. Bernardus Witbier and Abt 12 is still one of the top 5 most-viewed blogposts. I've previously had the Tripel on many occasions and it's world-class, but I'm going to focus on the two new beers in this post. First up, some Prior 8, a "dubbel" style ale. The choice of glassware for this one is about as obvious as they get... yeah, I went with the St. Bernardus chalice that came with the beers. This dubbel clocks in at an appropriate 8% alcohol, although the Abt 12 isn't a full 12% and the 6 which comes next is closer to 7%. It's a dark brown color with a bubbly white head. Great looking beer. It smells of plums and raisins and a little chocolate too. The taste is very similar to the aroma. I really like the chocolate flavor on the aftertaste. It might not be a perfect example of the style but it's still pretty damn tasty. Very drinkable, super smooth and delicious. As with the beers from St. Bernardus I've had before, this one is a winner. 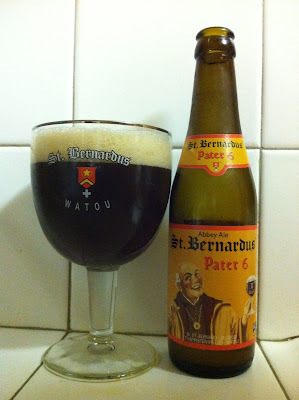 The second new one was the Pater 6 ale, also considered a dubbel, but this one clocks in at only 6.7% which is stronger than the average beer but a little on the low side for a dubbel. 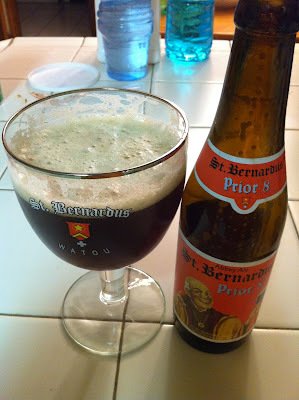 Just like the Prior 8, I took advantage of my new St. Bernardus glass. It's a murky brown color, finger or so worth of creamy head. Good retention and decent lacing. It has a floral aroma, malty as well with a little dark fruit to it. The floral notes are the most noticeable flavor. There are several flavors that are similar to the Prior 8, but the floral notes are a change from the chocolate tones of the previous beer. The floral hop notes are definitely the dominant flavor on the tongue. The malt flavors on the nose are much less obvious here. It had a good mouthfeel as expected, as it was very well carbonated and bubbly. Not my favorite St. Bernardus beer but still good... I think this one is a little less appealing than the Prior 8, and neither stacks up to the phenomenal Abt 12.